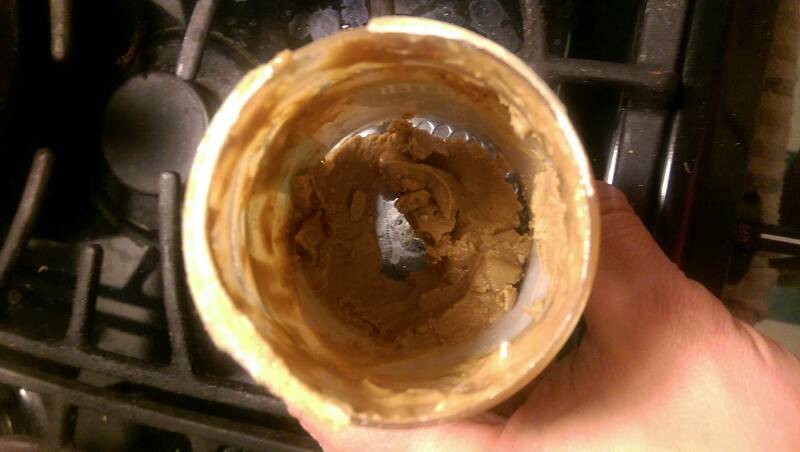 How can I salvage hardened peanut butter from the bottom of the jar? Is there anything I can put in it that will soften it but also add to the taste, or at least not affect it negatively? As long as the peanut paste at the bottom of the jar hasn't gone rancid, I'm pretty sure the bottom of the jar gets hardened and dry because the peanut solids have sunk to the bottom while the peanut oil has floated to the top, and as you use the peanut butter, a deficit of peanut oil develops at the bottom of the jar. I usually try to keep re-mixing the jar as I use it, so I haven't really tried this, but I'll bet if you stir in a little peanut oil, that dry peanut-plaster would soften up and become like its old self again. While lorel C's answer, to use peanut (or some other kind of oil) is likely the best, a couple alternatives suggested themselves to me. I've had decent luck adding a bit of water instead - though the peanut butter should perhaps be used up quickly in that case (since addition of water will make the product somewhat less shelf-stable). It does nearly the same job of loosening the peanut butter to spreadability, adds very little flavor, and is available very easily. If you add too much, it does dilute the flavor a bit, but not badly so if you just need a little. Another possibility is the addition of heat. Warming up the peanut butter just a little will let it melt a bit, loosen up and liquify, and it can be more easily worked with in this state. Since it will harden right back up when cooled, you might want to do this only when you're going to finish it off, or when you are pairing with an addition of either water or oil to keep the peanut butter loose after it's cooled back down. If you like natural peanut butter, you'll know that the oil separates really easily compared to the other stuff. I've found that putting the whole jar in the microwave for a few seconds always does the job. Not until it gets hot -- just until it loosens up a bit. Heat water in pot (do not overfill) and put your peanut butter jar in (only if in glass container obviously). Add little, slightly heated soy milk (sweet, dense, protein). To the amount of the picture above - add 1 tbsp. Stir the softened peanut butter until milk is incorporated and you've achieved that nice consistency! in most nut butters the oil will separate leaving the bottom over time dry and oilless. Especially in organic nut butters. I found that warming the left over nut butter in the microwave for 30 seconds* at a time will help in the beginning. But be careful! The microwave will not completely liquefy your nut butter. Try not to over cook it. After softening in the microwave, I would recommend mixing in some oil that isn't too flavorful. I found mixing in a bit of water works fine though. You could even make your own mixes to make that last little portion of nut butter count by mixing in honey, unrefined coconut oil, or even Nutella if you so desire! So far, the best softening and taste option I've found is to add a little olive oil. In fact, I just ate a PB sandwich with the olive oil recovery in it and it tasted scrumptious!